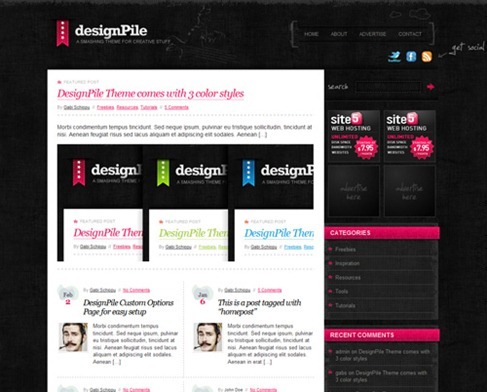 Free WordPress Theme – Designpile | WordPress Theme | All Free Web Resources for Designer - Web Design Hot! DesignPile WordPress Theme, a theme designed by Site 5 and released for Smashing Magazine and its readers. The theme comes with 3 color styles and a couple of jQuery-based goodies. It can be used for portfolios and blogs as well as corporate webAs usual, the theme is free to use in private and commerical projects. License: Free for personal or commercial use, licensed under creative commons license. This entry was posted on Sunday, February 21st, 2010 at 5:48 pm and is filed under WordPress Theme . You can follow any responses to this entry through the RSS 2.0 feed. You can leave a response, or trackback from your own site.